Soft and golden. Hearty and flavorful. These Caramelized Onion Buns are a match made in heaven for your hamburgers and sandwiches. Pile on the roast beef for an out of this world French dip! Anyway you slice it, you’ll never want to go back to boring store bought buns after having one of these fresh from the oven. My sister and I spent a lot of time with our Auntie Marilyn in the summers as kids. The best way to describe her would be if Mr. Rogers had sister. Auntie Marilyn was the most gentle and kind woman ever. She never had to raise her voice to get your attention. She had a way of making everything seem like an adventure. Auntie was a farm wife, still is, and everyday we’d set about making up lunches to take out to the men in the fields. It was at her side that I first watched with awe as she kneaded and shaped buns for sandwiches. Previous to that I hadn’t realized that buns were something that could even be made at home! I thought that they all came from the store! What a treat a fresh grilled hamburger is on a homemade bun still warm from the oven. If you’ve never tried it, you’re really missing out. It’s taken me several years to get my bun making to come anywhere close to my Auntie Marilyn’s, but I’ve gotten to where I can hold my own and craft a bun that will hold up to the meatiest, juiciest burger you can dish up. And now, I’ve got a new generation at my side, watching as I knead and shape. Their little eyes just as wowed as they see the dough take shape, rise and transform. To make the process easier for these buns, the onions can be cooked the night before if desired. Just toss them in with the mashed potatoes and heat them up at the same time. 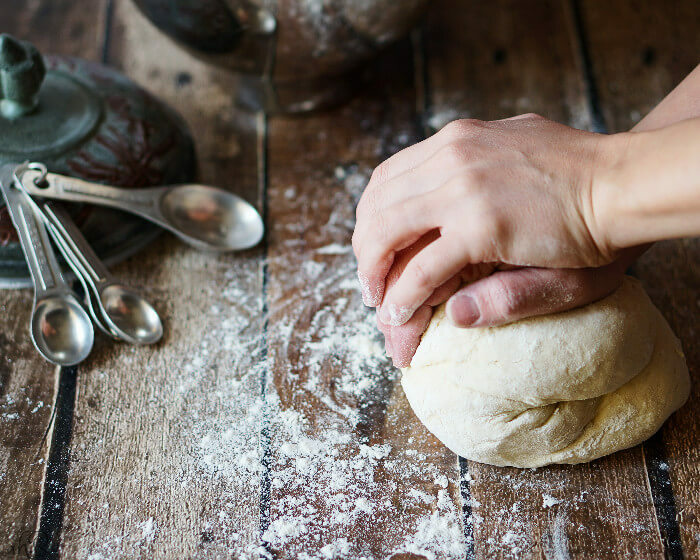 After the initial rise and shaping, the dough can be frozen for up to six weeks. Just thaw the dough out and let it rise before baking as directed. To make sure that your buns rise and stay draft free, put a clean tea towel in the dryer and then layer the warm towel over the buns and plastic wrap. It will provide warmth and keep it in as the dough has it’s second rise. To make the caramelized onions melt 2 tablespoons of butter in a skillet over medium heat. Add the onions and the salt and saute for 20 minutes or until the onions are a caramel color. Cool. Gently stir together the yeast and warm water (water should be 100 to 110 degrees) until the yeast is dissolved. Add the warmed potatoes, caramelized onions, sugar, and butter to the yeast mixture. Beat with an electric mixer until well blended. Add in flour one cup at a time, until the dough becomes more stiff and harder to beat, about 2- 2.5 cups. Turn the dough out onto a well floured surface and knead in the remaining flour. Knead for approximately 5-7 minutes, until the dough becomes smooth and elastic, sprinkling with flour as needed to prevent sticking. Shape the dough into a ball and place in lightly greased oven safe bowl, turning once to grease the top as well. Turn off the oven, cover the bowl with plastic wrap and allow to rise in the oven for 30 minutes or doubled in size. Punch the dough down and turn it out onto a lightly floured surface. Divide the dough into 12 equal portions. With floured hands, shape each portion into a ball. 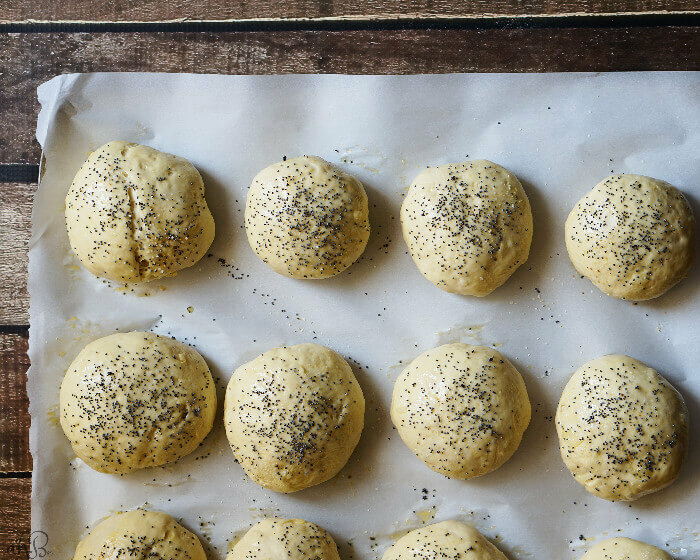 Place the shaped buns onto a parchment lined baking sheet. Preheat the oven to 350 degrees. Cover again with plastic wrap and allow to rise again in a draft free space for 15-20 minutes, or until doubled in size. 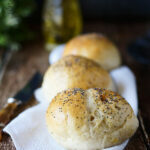 Very gently brush each roll with the beaten egg wash and sprinkle with poppy seeds. Bake the buns at 350 degrees for 15-18 minutes or until the buns are golden brown. These are without a doubt THE BEST onion buns. I’ve made them dozens of times, thank you for this recipe! 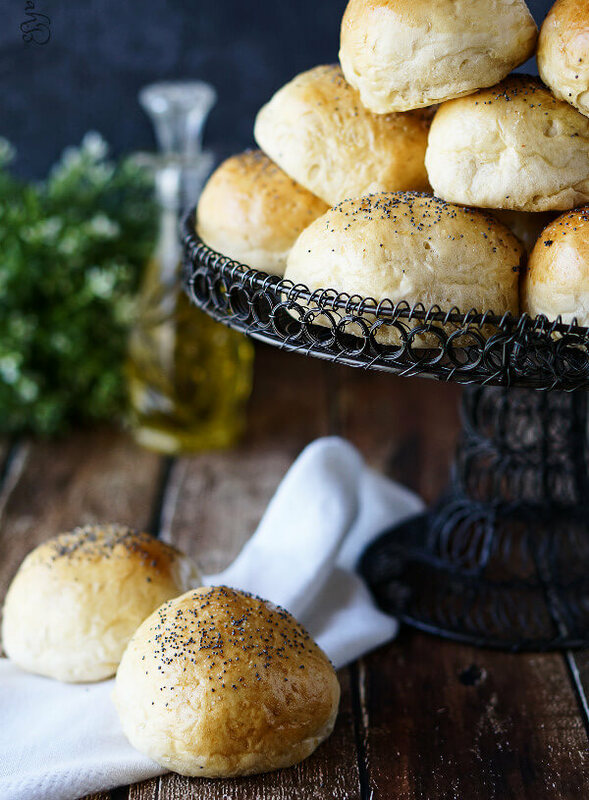 We have them as dinner rolls for company (huge favourite of my Russian friend, they are just like her mom/grandma made), with soups, for sandwiches- they’re great! I like to add a few T of poppy seeds to the dough, too. Thanks so much for this recipe, I’ve made it several times now. 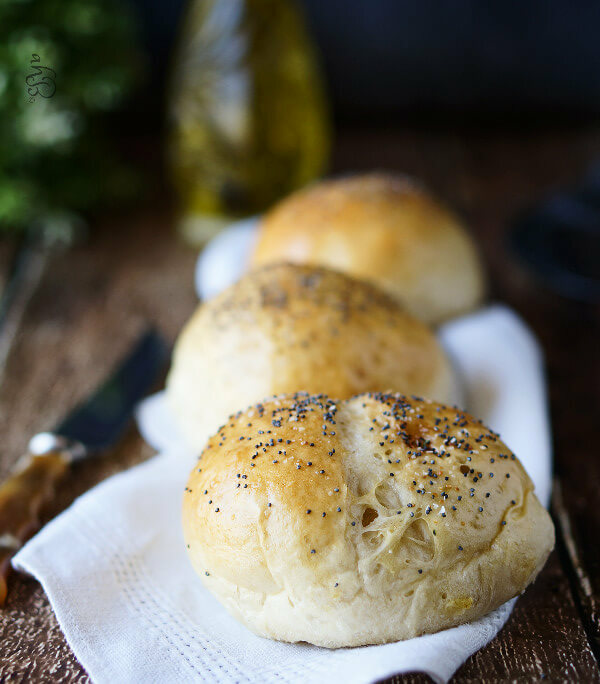 We’re big fans of onion buns here and live in Australia, I’ve learned to cook so many things I used to just pick up in the USA… These are the best, best recipe, and the little bit of potato is genius, just perfect. Thank you! Thank you Persephone! I’m so happy that you’ve enjoyed this recipe. Amazing what that little bit of potato adds to a bread recipe, isn’t it? These look amazing! I probably wouldn’t even get to making a burger with them, they would disappear too quick. I am loving your dough recipe! So different! The onions are a great addition! Yummed! My oh my these look so good they are making me hungry as I type! I’m not a very good bread maker but I agree that homemade is best. This makes me want to try again! Pinned for later! The mashed potatoes definitely give this dough a great texture when they are baked. Soft, but not wimpy, totally up for the task of a big, juicy hamburger. I hope that you enjoy them! I love homemade bread! I’ve never made savory buns, other than plain wheat burger buns! Have to try these ASAP!!! The addition of the mashed potatoes and caramelized onions really adds a great texture and flavor to these. I’m thinking that perhaps I need to start storing leftover mashed potatoes in the freezer so that I’ll have them on hand for baking in the future! Seriously though, these are gorgeous! I love the addition of poppyseed. I feel like these would taste like ‘everything bagels’, and I loooooove everything bagels. Totally going to have to try these out. Well played, Dana, well played. You really should try these! But be warned, once you start making homemade buns you’ll really never want to buy store bought again. Oh indeed, the smell of bread baking is almost the best thing in the world! Great pictures! – I’ve never made buns to use myself for sandwiches although I do like to bake bread, etc. I also like the idea of warming a tea towel up in the oven to put over the rolls for the second rise. Aren’t you a genius to think of this! I think you meant to type dryer, Kathie. Heating up your towels in the oven might be dangerous. But pulling a hot towel from the dryer can do wonders for holding in the heat for that second rise!